Not a movie, but a collection of varied quality 2010 - 2013 zombie shorts mashed together by a rather strained news-reader narrative. Presented by Dread Central these 11 short films have nothing in common other than their gut munching brothers and sisters, so some credit should be given that there's something to tie them together at all. 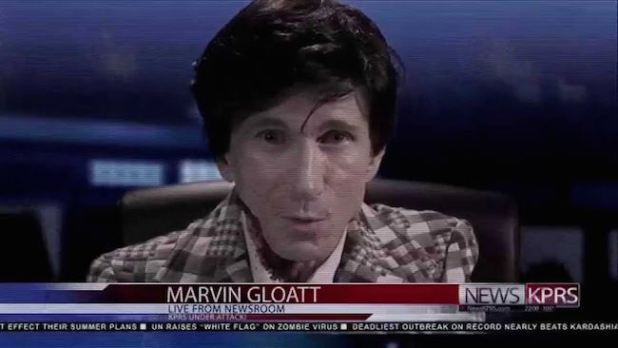 Also Bill Oberst Jr. as Marvin Gloatt does a half reasonable job portraying a reporter deteriorating to a zombie bite with a script almost always lacklustre and overreaching. I've reviewed each film separately. Some are good, some are bad, most are average. As an overall product I feel hard pushed to recommend it as the great shorts can be found independently and other than Adrián Cardona and David Muñoz's audaciously excessive duo Fist of Jesus and Brutal Relax I doubt any would be watched a second time. Still promoting amateur zombie film making is something I feel should be rewarding so I'll be kind - 5/10. These cohesive wrangles aside Dark Times is a reasonably competently put together little bit of apocalyptic carnage that just tries too hard to not only stop and think (see above), but too hard to cast off the derivative accusation it surely wears. 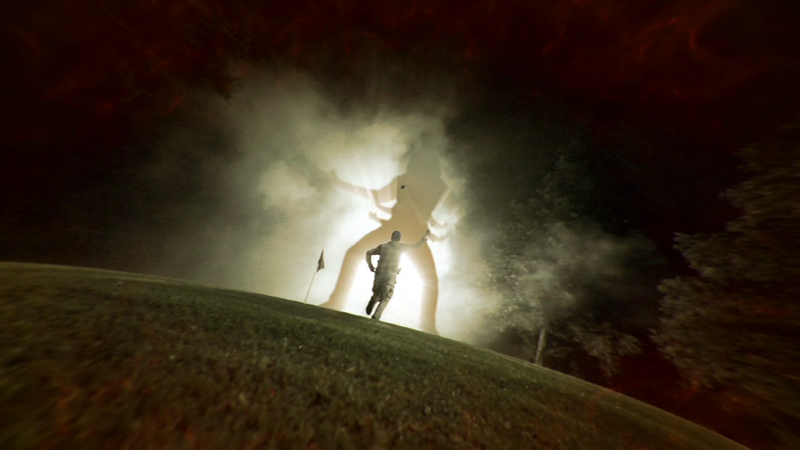 I can understand writer / director's Peter Horn and Jared Marshall's fear and could even get behind some of the genre-play, especially the first person transformation, casting aside its, again, disjointed feel, but by the finale it felt they'd given up any desire to remain cohesive or consistent at all, and it suffered for it - 4/10. Okay, where to begin with the silly little gem. Blasphemous? Most definitely, though with tongue firmly in cheek and no real desire to offend ala Monty Python etc. Excessive? Off the chart with perhaps only their previous gore-fest Brutal Relax or Dead Alive (Brain Dead) coming close. Yes it's also prosthetic madness but with such little regard to reign things in, whether it's spinal cords beings ripped out or heads being popped, the comic anti-realism just adds to the insanity. Finally, any good? Yes, it's quite the riotous ride, though perhaps it does actually go on a tad too long allowing me to finally apply the phrase gore-bore; after thinking it up years ago. Another Adrián Cardona and David Muñoz must watch, but for all the wrong reasons - 7/10. Over-all a highly stylised pop-culture bit of zombie fun that manages to blend story and comical narrated instructional video cohesively and engagingly. 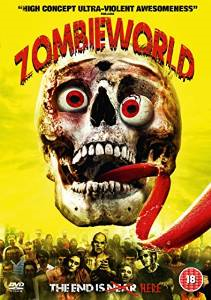 Split into segments, something Zombieworld takes advantage of to spread it across its presentation, some are distinctly better than others and sometimes the humour misses the mark, but overall it's a highly engaging little romp. There's a play with genres from people who obviously understand post-zombie cinema and it's a recommended throwaway bit of fun - 6/10. A brief flirt with action quickly turns into a six minute mildly amusing, utterly throw-away one-man ramble. Chris (Matt Prendergast) spills out the annoying diatribe of self-obsessed irreverent nonsense to his dying house mate and whilst I can respect what they were trying to do it's just not all particularly funny. A tight little play; it's not bad in what it's doing; I'm just not sure why anyone would have done it in the first place - 3/10. A great little ground zero short. Tense, gripping and dark, this to the point zombie footage-cam flit fits a lot into five minutes, even managing a pervasive hint at a larger problem. Very good and would love to have seen something bigger from director Tommy Woodard, who went on to become location manager on such series as Fear the Walking Dead, 8/10. A short survivalist film playing with isolation, loss and grief in the Australian Post-Apocalyptic outback. Jaimie McDowell staggers lost and confused mourning the loss of her would be husband between one gut muncher and another fully occupying the empty barren tundra. An average composition if we're honest, that even manages to drag out a bit. Moody, indulgent, and a bit up its own behind, it's still tight, well performed and shot - 4/10. A mixed bag shaky cam short from Director Zach Ramelan. Full of energy it's a wild little zombie survivor chase that's interesting and engaging yet entirely throwaway. There's a nice little twist at the end but for the most part it feels like a cheap thrown together / made up as it's going along student project, with mates acting as a favour rather than a calling - 4/10. A one gag throwaway short; but one that actually works. An idea played with in Demons 2, though reversed here; but we'll let it go, as it's so well put together, brutal, straight to the point, and delivers. A delight - 8/10. A delightful and charming rural 1950's zombie tale in the Creepshow / Tales from the Crypt vibe. 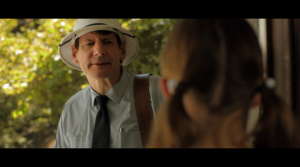 It's postman Frank Nuttell's (Thomas Garner) first day on the job and he's soon intently embroiled in the sad tale of a young girls lost father and brother to a mining accident, and a mothers forlorn denial. Writer / director Luke Guidici's little yarn works, is well performed and delivers a great punch line which I won't spoil - 8/10. Another truly eccentric zombie silly from Adrián Cardona and David Muñoz. 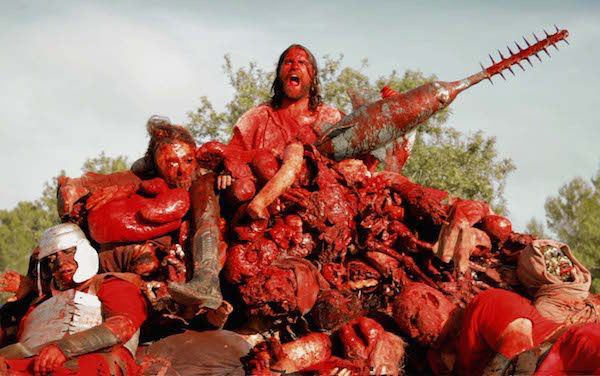 A silly a show-case for excessive violence, it's audaciously over the top and really if we're all honest, just an excuse to fit as much gut ripping, bone splintering, head exploding and blood spilling nonsense into fifteen minutes as possible. Also if we're honest, I'm only reviewing this as it appeared on Zombieworld as I don't think the sea-lizard-creatures from the black lagoon are actually remotely zombie. Still, it's breath-taking relentless fun, and doesn't quite get as gore-tedious as their subsequent Fist of Jesus; also José María Angorrilla provides a lead role performance I'll never forget - 8/10. 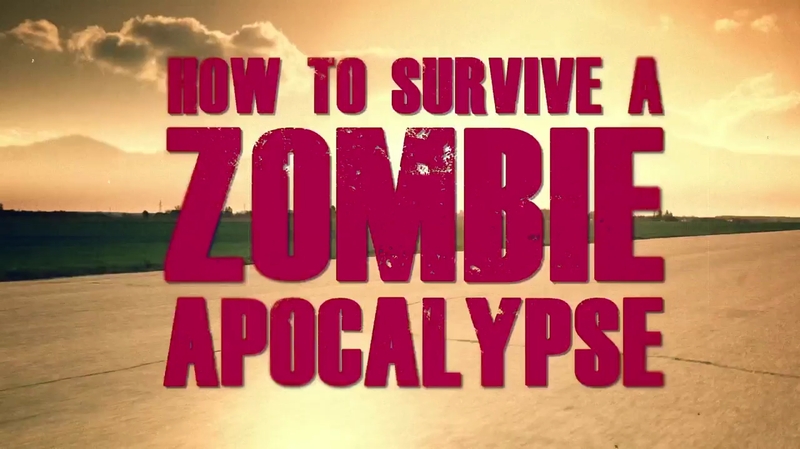 Entirely throwaway short zombie chase, followed by nice clean CG narrated zombie global pandemic intro video. A promotional video for the Montreal zombie run event, it did its job, but is entirely too lightweight as an entity in its own right to really pass any kind of meaningful judgement; still, it is quite a nice atmospheric 30 second chase - 4/10.